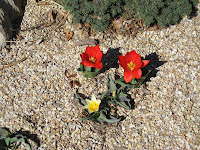 I am always so excited to see the first flowers of spring poking their heads through the soil and adding much needed color to an otherwise drab landscape. After a season of working in the yard, it is often hard to find the time or motivation to plan for spring color; but Fall is an ideal time to plant bulbs. By taking a few moments to purchase bulbs now, you can reap the benefits in the spring with beautiful color and variety bursting in your yard. It will be well worth it! Now you can purchase bulbs online and support the Garden! Brent and Becky’s Bulbs has a fundraising program designed to support non-profit organizations. By going through http://www.bloominbucks.com/ and selecting Idaho Botanical Garden, the Garden will receive 25% of the total sale.